Rivenspire is the northern region of High Rock. It is a gloomy region, with jagged rock formations punctuating the rather bleak lowlands. The majority of creatures found in Rivenspire are of the aggressive type, including wolves and wraiths. Local hunters also make a living off the abundant giant bats and spiders. It is separated from Glenumbra and Stormhaven by the Darguard ridge of mountains. Following the events of Ranser's War, Rivenspire has been ruled by a triumvirate of Breton noble houses: House Tamrith, House Montclair and House Dorell. Directly south of the capital city of Shornhelm sits Oldgate, the northern end of the mountain pass to Stormhaven. House Tamrith primarily has holdings in Eyebright Feld, the western region of Rivenspire, with enterprises focusing on agriculture and commerce. While the terrain is quite sparse, pastoral farming has survived at Hinault Farm due to the frequent rain showers prevalent in the region. Silverhoof Vale presents another good example of adaptation, as the Horsemen of Yokuda have abided there for three thousand years. 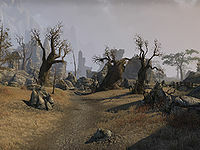 The rocky region of Westmark Moor in the southeast is the location of Traitor's Tor, where King Ranser made his final stand against the Orcs of Wrothgar at the climax of Ranser's War. The nearby Old Shornhelm Ruins have become a major encampment of the Bitterhand Bandits. To the northeast, the main road leads through the town of Fell's Run and into Boralis, home of House Dorell's city of Northpoint. 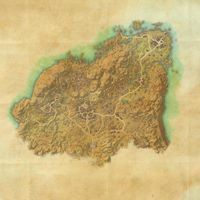 Unlike the southern regions, which are predominantly overcast, the coastal region of Boralis frequently sees clear skies. In the west of Boralis lies the ruins of the ancient Ayleid city Erokii, above which towers the mystical Doomcrag. Favor for the Queen: Set sail for Alik'r at the behest of the Queen. A Change of Heart: Help locate the missing members of the Edrald family. A Past Remembered: Learn about an ancient sword. Shedding the Past: Help an Argonian bandit start a new, peaceful life. Lover's Torment: Free a cursed soul from her torment. 5 items: While you have a pet active, your Max Magicka is increased by 36-3150. 5 items: Reduces the cost of Sprint and Sneak by 50%. 5 items: Increases your Max Health by 13-1118 for you and up to 11 other group members within 28 meters of you. This page was last modified on 10 December 2018, at 07:20.